A new exhibition coming to the Milwaukee Art Museum (MAM) and Denver Art Museum (DAM) will explore how the spirit of play has become a serious part of design conversation. Serious Play: Design in Midcentury America will open on September 28 at the MAM and will move to the DAM on May 5 next year. The exhibition takes a close look at the cultural production of mid-century America. Postwar architect and designer Alexander Girard was a pioneer in introducing playfulness into the household with his flexible and imaginative wall storage units and eye-popping armchairs and ottomans. Architect and professor Anne Tyng was also a key figure in merging the fields of play and architecture, developing a modular system where plywood pieces can be assembled into anything from a toy to a piece of furniture. The exhibition will include over 200 works in different media, from paper crafts, to mid-century favorites like plywood and composite boards. It will revolve around three themes: the American home, child’s play, and corporate approaches to design. Items such as Irving Harper-designed clocks, the Eames Storage Units, and videography of Ray and Charles Eames will be featured. Pieces by lesser-known designers fill the show. A color-blocking cabinet made of lacquered Masonite and birch, the Swing-Line Toy Chest, by Henry P. Glass will be on view as well as lithographs by the graphic designer Paul Rand along with stoneware by dinnerware and home goods designer Eva Zeisel. Arthur Carrara’s toy design (shown at top) is a highlight. The Chicago architect and designer created magnetic toys inspired by Frank Lloyd Wright’s Prairie Houses and the modern movement. 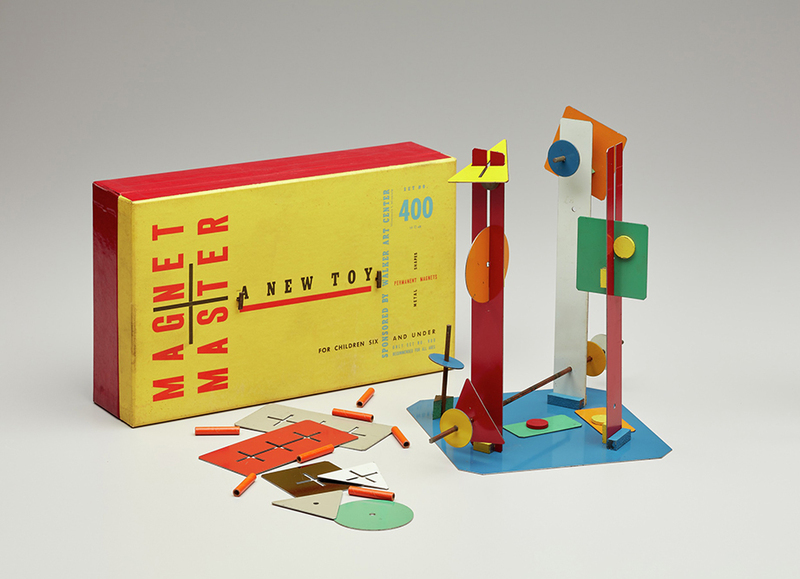 First sold in a yellow cardboard box, the set includes metal plates with magnetic joints, and children were encouraged to explore their creativity by building three-dimensional sculptures. According to a statement from the DAM, a myriad of different factors came together to allow for the bold design of the fifties and sixties. “Diverse materials and manufacturing techniques opened up possibilities for new approaches to design and larger-scale production.” As average income grew and leisure time increased after WWII, a larger segment of the population was able to afford high-design items. They turned their attention towards childhood development and were willing to invest in child-friendly furniture pieces and designer household objects. The statement also attributed “escapism into everyday spaces” to the anxieties of the Cold War. 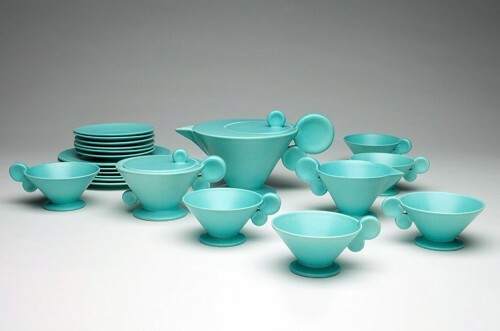 Grete Marks: When Modern Was Degenerate Milwaukee Art Museum 700 North Art Museum Drive Milwaukee, WI Through January 1 Grete Marks was born in Cologne in 1899 to an artistic Jewish family, and she enrolled in the ceramics program at the Bauhaus School in 1920. In 1923 she left the school to marry a young industrialist with whom she founded the Haël Factory for Artistic Ceramics to produce her designs. These works are composed of simple geometric shapes, glazed with striking colors and patterns in the style of Soviet Constructivist painters and showcasing the Bauhaus ideal of uniting industrial mass-production with Modernist aesthetics. Marks’ legacy as a potter was cut short by the Nazi party when in 1935 they declared her artwork “degenerate,” and her avant-garde pottery career ended with the onset of World War II. This will be the first American exhibition to explore Marks’ work and the circumstances that have prevented her name from entering the list of Bauhaus greats. Currents 35: Tara Donovan Milwaukee Art Museum 700 North Art Museum Drive Milwaukee, WI Through October 7 The work of Tara Donovan demands close reading. By using strict rule-based systems, Donovan accumulates individual pieces of material into installations that defy easy identification. Milwaukee Art Museum chief curator Brady Roberts explains, “Donovan’s process involves selecting one material and finding one unique solution for its construction, whether it’s folding, gluing, stacking, or pressing.” Taking cues from 1960s conceptual artists like Donald Judd and Sol LeWitt, whose works rely on rule-based processes, Donovan obscures her quotidian materials to compose spectacular objects. 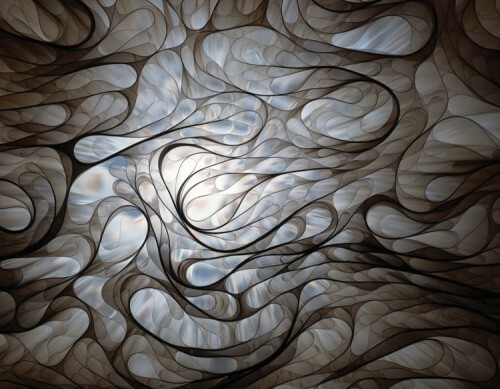 The exhibition includes several major works including Haze, a 32-foot wall covered in approximately three million straws, Unititled, 2008 on polyester film (detail, above), and Drawing (Pins), 2011 composed of gatorboard, paint, and nickel-plated steel pins. 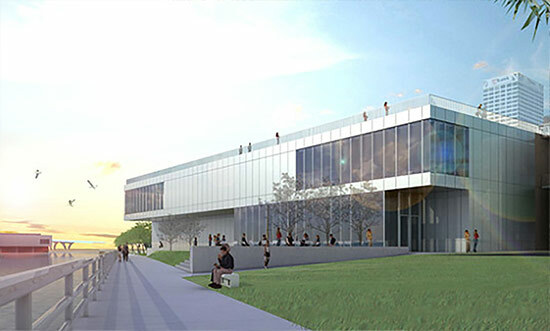 700 North Art Museum Dr. 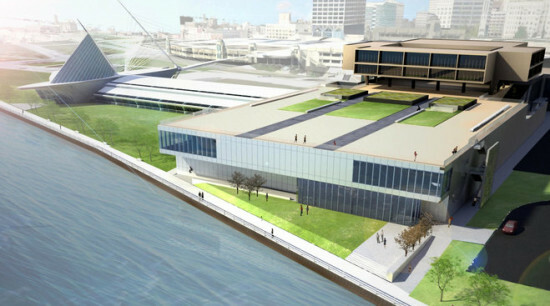 Architect Frank Lloyd Wright is the single subject of the Milwaukee Art Museum’s new exhibit. 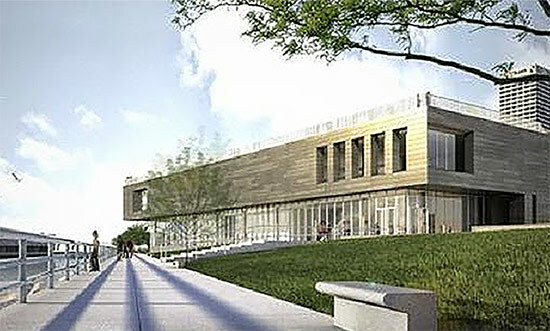 Organic Architecture for the 21st Century, which celebrates the 100th anniversary of Taliesen, Wright’s Spring Green home and studio, also marks the debut of 33 never before seen drawings by the Wisconsin native. The show implores visitors to take a fresh look at Wright and his works, both built and unrealized, and how he envisioned architecture as something that had an essential relationship to context, time, and the people who lived or worked there. 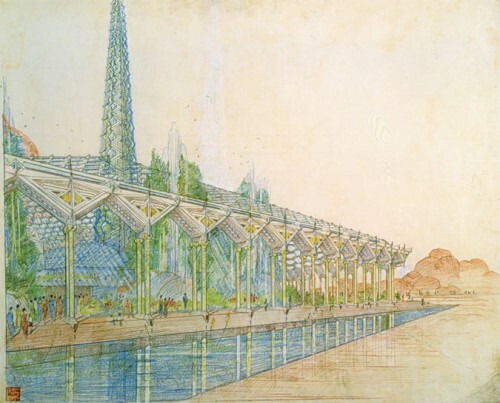 Sustainability, which we often think of as a 21st century innovation, is in keeping with many of Wright’s designs, especially those for a newly suburban America, including the outdoor arcade for the proposed Arizona State Capitol, Phoenix (above). Organic Architecture for the 21st Century explores the idea that the famously outspoken architect was a visionary who foresaw trends including the use of mass produced materials, utilization of natural light, and attention to the surrounding environment. In addition to covering his major works, like Fallingwater, the Johnson Wax factory, and the Unity Temple, the exhibit also showcases plans for Living City, a culmination of Wright’s work and his utopian vision for suburbia.